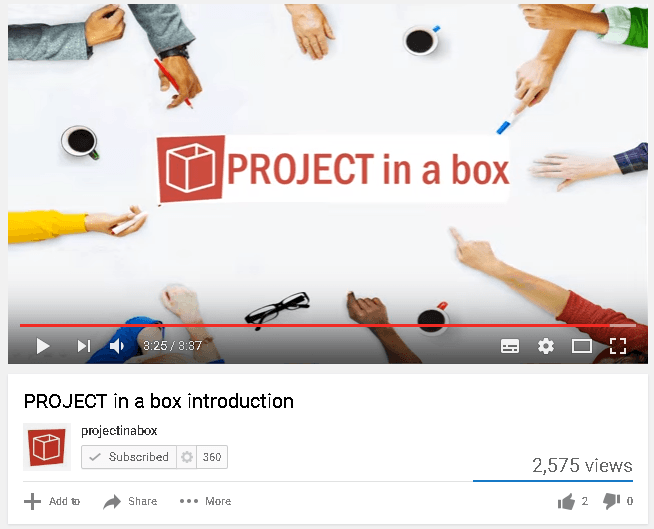 Finding out more about project support from PROJECT in a box and how it could help you couldn’t be easier. Our website is full of useful resources and here are the top five areas highlighted for you. We have an extensive library of videos on all of out products in use both here on our site and in our popular YouTube channel. If you are looking for a good place to start then this brief introduction will be ten minutes well spent. Our products have been regularly featured in independent reviews in the press and on websites over the years. Read the latest review in full here or check out our Review pages to see a wider range of reviews. The Customers page also provides access to the diverse range of organisations who use PROJECT in a box for their project support office (PSO). Most of our customers, including those who go on to be our largest multinational customers have started by using our free Community Edition and Planner tools. These are not trials and are full applications for Windows environments so you can get a good feel for how PROJECT in a box can help you with your project support. Register now to download and get started. Use the list down the side of this page or in the footer of every page to browse the varying capabilities we provide across the product range. Each page contains information, videos and other resources to inform on the topic. The Methodology pages previews the twelve standard project and programme methodologies we provide off the shelf. Furthermore how you can personalise these or create your own methods and processes. Hopefully the sections above will have given you a great understanding of what our products deliver. Consequently how valuable this has proven to be to our customers over the years. You may have further questions or would like to arrange a demonstration of a particular product. If so please contact us and we would be delighted to assist further.